EasyHits4U got hit not long ago, but this time it was ClixSense who had its PayPal account blocked. They tried to deal with PayPal, and being that ClixSense is a legitimate business that has been operating without any problem for 7 years, one would think that they would find a solution, but they got cut anyway because PayPal can, at any time, change its terms of service and cut any service that doesn’t comply to the change without any recourse. The answer by ClixSense has been nothing short of excellent. They informed the community of users (their forum is very active and the community is very helpful), and began working on alternatives. And now they are here. Personally, I never really liked PayPal, I see it as a necessary evil that we have had to put up with because there were no other alternatives to the service they were providing. However, that is not the case now. We have payment processors with a lot better options for their members; some that allow easy withdrawal to bank accounts, some that have a MasterCard available to use your funds. PayPal only allowed to pay for services that accept PayPal. With those cards you can do it anywere that accepts Mastercard, and use ATMs if you get the physical card. To enable any of the alternatives in ClixSense you need to move the mouse over your name, and then click on “Profile and Settings”. In there you can select the method by which you desire to cash-out. I will make a very short introduction to them but there will be an article dedicated to every one of the different payment processors in the near future. Also, the processing fee taken by Payoneer is USD$2, which means that if you want to receive money in your bank account, you should withdraw over USD$27, Payoneer will show that you have USD$25 and you can withdraw those. To be on the safe side, just cash-out over USD$30, then transfer to your bank account. I will make a full post dedicated to the handling of Payoneer, I am not done experimenting with it as well as with other alternatives, that is why I haven’t really publish, but it is coming quite soon. The minimum that you can cash-out with Payza is USD$6 as premium or USD$8 as normal user, and the fee taken by Payza is USD$1.34. Payza allows many options to withdraw the funds, from a bank account, to even Bitcoins if you have made your Bitcoin wallet. But YOU MUST VERIFY YOUR ACCOUNT TO WITHDRAW OR PAY. Otherwise you will have your funds, but you will not be able to use them. Payza also will get its own post in the short future. The minimum that you can cash-out with Skrill is USD$6 as premium or USD$8 as a normal user, and the fee taken by Skrill is USD$0.36. While Skrill allows you to withdraw to a bank account, Skrill has the option of getting a prepaid MasterCard so you can use your funds in normal stores, online, or you can get funds from an ATM. And yes, Skrill will also get a dedicated post. It takes a little time to finish a full run-down of the alternatives, plus moving money, plus withdrawing the money, plus sorting out all sorts of issues, but I am working on it. Once hat is done my expectation is to share anything I find here. The world of PTC is changing, and it is growing. We are still afflicted by a massive massive number of scams and frauds, but some systems, one of them ClixSense, have shown their commitment to their user-base. ClixSense is completely recommended, both to use, and to refer. What happens to my promotion if you join under me? That promotion where if you generate the cost of the premium membership for me I send you that via PayPal (after you send me an opinion about ClixSense) will be changed, but anyone who joined under me before the date that PayPal was lost, if you get to the USD$17 for me and you wish to have them on PayPal, you will get them there. For the other systems I will probably let you choose which one you desire, of the ones available in ClixSense at the time you reach the threshold of USD$17 generated for me. 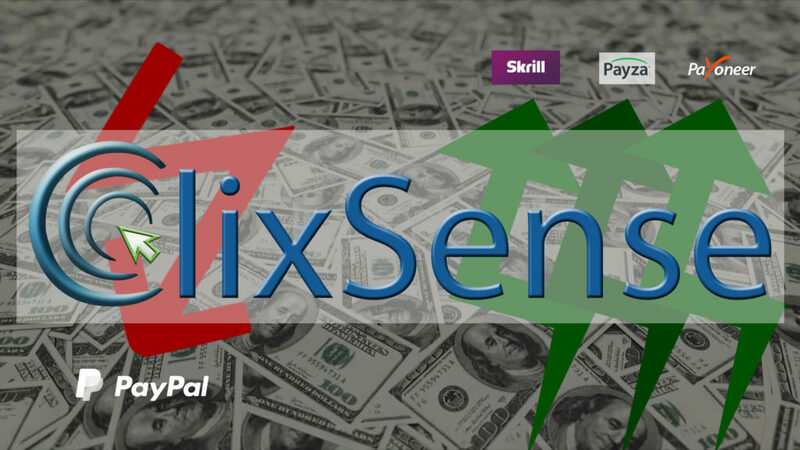 I may even allow you to choose Bitcoin, only PayPal will not be available to chose if you joined ClixSense after PayPal terminated the service.